The deep-space dog-fighting game arrives on the Game Boy Advance with an impressive 3-D combat engine. Origin (now part of EA) created the first Wing Commander space-shooter more than a dozen years ago. Several sequels and an animated TV series followed, culminating in a seldom-seen 1999 movie starring Freddie Prinze Jr. and his favorite sidekick, Matthew Lillard. Now, thanks to the power of the Game Boy Advance, the 3-D action comes alive in portable form. Lt. Christopher "Maverick" Blair, Lt. Todd "Maniac" Marshall and other familiar characters return. Much of the plot unfolds through conversations in the Rec Room. The graphics are a high point. A ship that appears as a distant speck becomes extremely detailed as it roars closer. Missiles leave smoke trails and explosions pack plenty of punch. Everything is backed by fine sound, including digitized voices. An impressive multiplayer mode supports head-to-head combat for as many as four players. This requires GBAs and Game Paks for each player and enough GBA Game Link cables to connect all systems. 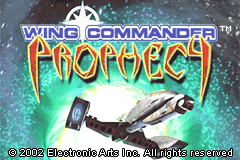 Wing Commander Prophecy successfully combines fast, arcade-like space combat with surprising depth.